In London this month, National trade body The Property Care Association (PCA) and other organisations involved in the Japanese Knotweed control industry will be sharing news on recent work in research, smart phone apps and best practice guidance for surveying and controlling this problematic plant. The Phlorum ‘Specialist Seminar – Japanese Knotweed’ takes place on Tuesday, April 23rd, at The Institute of Physics in Portland Place. At the event – hosted by founder members of the PCA Invasive Weed Group, Phlorum – Steve Hodgson, PCA Chief Executive, will be joining other guest speakers to consider the effects of Japanese Knotweed on property and construction. He will be outlining details about the forthcoming ‘Code of Practice for the Management of Japanese Knotweed,’ drawn up by the PCA in close collaboration with Phlorum and other leaders in the invasive weed control industry, to provide a concise and thorough guide to the management of this invasive plant. Co-ordinated efforts to establish sector representation on the effects of Japanese Knotweed on property were completed some time ago, with input from the Council of Mortgage Lenders (CML), the Building Societies Association (BSA) and the Royal Institution of Chartered Surveyors (RICS). However, the soon to be published PCA Industry Code of Practice sets a new standard for those involved in the control and eradication of Japanese Knotweed. The code is being officially launched days later, at the PCA’s Annual Conference, at The National Space Centre in Leicester on Thursday, 25th April. Other guest speakers at the Phlorum Specialist Seminar include Philip Santo, a RICS Fellow, and former Chair of the RICS initiative on Japanese Knotweed and Residential Property, who will talk about the issues of Japanese Knotweed for surveyors and the recent RICS guidance that supports them. Dr Paul Beckett, a Director of Phlorum, will also provide a summary of Japanese Knotweed problems and best practice solutions, before David Kilbey, of Bristol University, introduces PlantTracker, an innovative smart phone application that uses crowd-sourced data to record locations of invasive weeds in a national database. Professor Tony Moore and Julia Shearman, specialists in Biochemistry & Molecular Biology at the University of Sussex, will also discuss how advances in biochemistry are helping us to understand Japanese Knotweed and to potentially develop novel methods to control it. Details on booking a place to attend the Seminar can be found at Eventbrite. Further information on Phlorum can be found on their website www.Phlorum.com. Phlorum is an award-winning multi-disciplinary environmental consultancy and leading expert in Japanese Knotweed management. 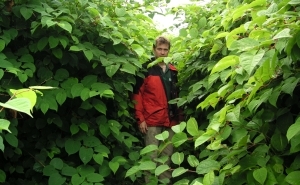 Keen to dispel the myths and enhance the knowledge available to deal with this invasive and problematic weed, Phlorum helped write recent guidance for the Royal Institution of Chartered Surveyors on assessing Japanese Knotweed risk. They were also instrumental in setting up systems to help lenders offer mortgages on Knotweed-affected property. This led to the formation of the Property Care Association Invasive Weeds Control Group, which is the first professional trade body for companies providing advice and services to manage Japanese Knotweed. Phlorum is a founder member of the PCA Invasive Weeds Control Group and has been instrumental in the writing of their new Knotweed guidance. Phlorum is also engaged in several streams of collaborative research to better understand, and hence to better control, Japanese Knotweed and its potentially costly and damaging effects on property.